Mulling Over The Middle: You Ever Dipped Snuff? As I was writing my book Leave Him? I felt the need to do a little research in order to be authentic; after all, how can you accurately describe something you have never personally experienced? 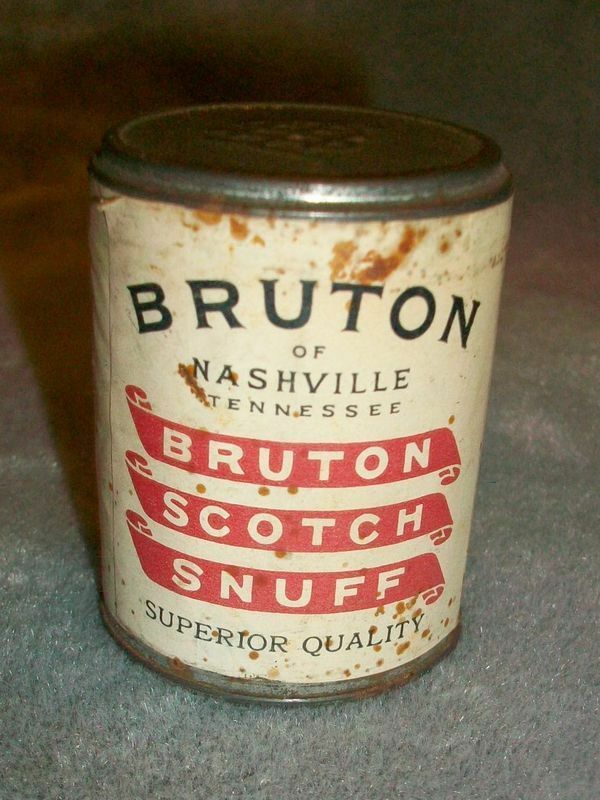 I went to the store and asked for a can of Bruton Scotch Snuff. The packaging looked much like I remembered although the container was now made of plastic instead of the tin of years ago. I had observed my great-grandmother ‘take a dip’ every time I saw her as I was growing up. To a young girl ‘taking a dip’ looked a lot like eating dirt and the spitting that was required afterward, done as discreetly as possible into a jar kept out of sight, was still appeared nasty-not something I wanted to do. As a kid, I was more inclined to try smoking, making my own cigarettes out of a brown paper bag rolled around a weed called rabbit tobacco; it was a cleaner habit. 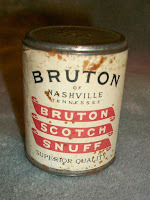 I had smelled of Grandma Pate’s snuff, but I never tried it. It took a bit of courage even as an adult to rake the brown powder in between my lip and teeth- all in the effort of research. The things we writers must endure. As the powder moistened the power of the snuff was released. I held it in my mouth long enough to figure out what it tasted like and pondered the appeal it must have had on a woman in her eighties. I then had what I needed to write the following scene, but you can bet that I was not interested in adopting dippin snuff as my new vice. The hours passed more slowly when a body got too old to stay busy. The slow ticking of the clock and less need for sleep gave plenty of time for the mind to wander. Ella didn’t take having a mind that could wander for granted. She had seen many who lived to see their eighties lose all their sense. She looked down at her wrinkled hands as she sat in her chair. Fighting the pain, she reached over to the side table to get her snuff can. She opened the lid of the Bruton Scotch Snuff can, put the wooden paddle in and withdrew enough for a dip. After a few seconds the familiar earthy taste filled her mouth. Her thoughts were a little clearer, and her heart beat a little faster. The morning sunlight brightened the otherwise dreary room. Her eyes had gotten so bad that she couldn’t see to sew or read. Plus she could hardly walk in the house, let alone walk in the yard alone. The metal walker helped her balance and get up and down, but it proved so cumbersome she had no way to get it down the steps by herself. Remonda, the youngest of Roselle’s kids, was the only one still living at home, so the house was a lot quieter than it had been when all of her five children lived with them. Ella Mae had grown accustomed to the noise of the teenaged girls fussing with each other and the younger Gary and Remonda playing. With Remonda gone to school during the days and Hoyt and Roselle working, the silence seemed to surround her. Ella Mae thought about that. These past few years were the first she had really been alone, and they dragged out since there was nothing to do. It was a warm, early summer day, and Ella Mae had been working in the house most of the morning with her mother. She wanted to get the gardening done in the afternoon and knew she would be bending over about a thousand times, so sitting a spell would be a welcome change. Sally smiled again as she unfolded the top of the small brown paper bag and reached in and pulled out a can of Bruton Snuff. “Awe, those ole women you saw doing that were just unrefined. You and I are going to be sophisticated dippers. The advertisement in the paper showed one woman using this wooden paddle like this one to put the snuff in her mouth while another woman, wearing the prettiest dress, carefully spit into a small jelly jar. I got everything we need to try it. See.” Sally pulled an empty jelly jar out of the bag and sat it on the floor between them and then she reached in and found a small wooden paddle that she sat in her lap. Ella Mae laughed out loud. Sally twisted the top of the can of snuff until it came off. The sudden loosening filled the air with an unexpected brown powdery cloud that flew up Sally’s nose. Ella Mae watched her friend’s nose wrinkle and her eyes squeeze shut as she let out a huge sneeze. Ella Mae carefully held the can under her nose just far enough to see what the contents smelled like. Ella Mae followed her example then the two of them rocked waiting for the presumed effect. As her mouth’s juices moistened the snuff, she felt her heart start to beat a little faster. A small calming started, maybe it was taking a minute to rock and just breathe or maybe there was something to this snuff stuff after all.